This TTM success got a couple cards out of my box that will look pretty nice in my autograph album. 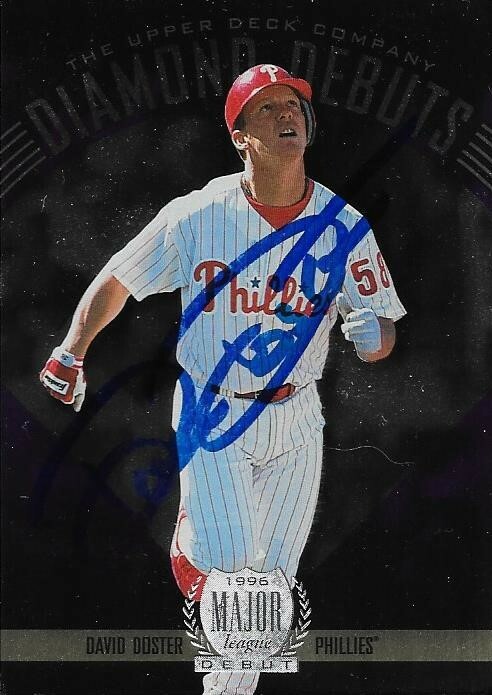 The above 1996 Upper Deck Diamond Debuts turned out really well, in spite of how the scan looks. 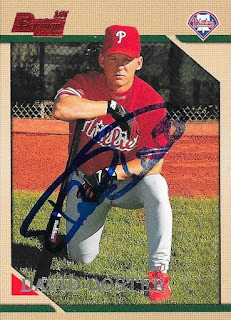 This 1996 Bowman came out of a box that I got while I was at Andrew's house a couple years ago. Doster (b. 1970) played in the majors in 1996 and 1999 for the Phillies. He had 47 hits, 4 home runs and a .233 batting average. I mailed to Doster on January 4 and got the cards back on January 15, for an 11-day TAT.